Christopher "Pitufo" Diaz has carved out a nice following in the Central Florida area, fighting in Kissimmee, Florida for the third time in his last four ring appearances. His latest showing marked the first time he was able to send the fans home early, halting Sergio Lopez in three rounds Friday evening at Osceola Heritage Park in their Solo Boxeo-televised main event. Diaz (21-0, 13KOs) scored two knockdowns, once each in rounds one and three with the latter producing the bout's ending at 1:45 of round three. The 22-year old featherweight from Baranquitas, Puerto Rico was forced to go the eight-round distance in each of his past two appearances at the venue, scoring decision victories over Raul Hirales and Fernando Vargas in his final two bouts of a six-fight campaign in 2016. He has already fought twice in 2017, producing knockout victories each time out. On the heels of a 7th round stoppage of Efrain Esquivias this past February in San Juan, Diaz wasted no time in taking the fight to Lopez (21-13-1, 14KOs). A series of left hooks and uppercuts floored the visiting Californian in the early moments of the opening round, although he was able to make it to his feet and survive the ensuing onslaught. Diaz never stopped working for the knockout, continuing to punish the body as often as he landed upstairs. Paydirt finally came midway through round three when a four-punch combination - capped by a left hook to the ribcage - put Lopez down and out for the night. Teofimo Lopez (4-0, 4KOs) remains a knockout every time out. The 2016 Honduras Olympian - who was born and raised in New York but now lives in Central Florida - had no issues in dispatching Jorge Luis Munguia in the second round of their lightweight preliminary contest. A slew of uppercuts had Munguia (12-9, 4KOs) on the defensive throughout the brief affair,but it was a left hook to the body that ultimately produced the bout's lone knockdown, as well as the end of the contest which came at 0:48 of round two. Jean Carlos Rivera had little problem moving past Jesus Pacheco in their eight-round featherweight heat. Scores were 79-72 all in favor of Rivera (11-0, 6KOs), a promising 21-year old prospect from nearby Orlando. 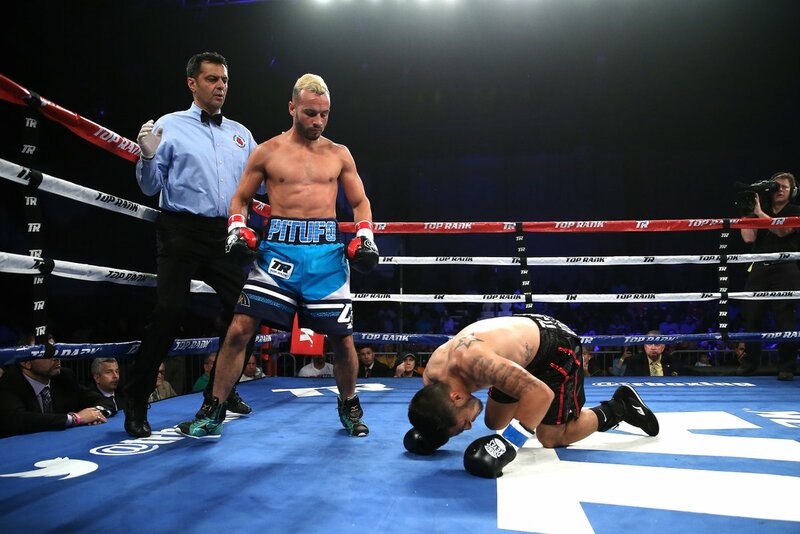 Jeyvier Cintron enjoyed a successful pro debut, earning a four-round decision win over Leonardo Reyes (6-13, 2KOs). Scores were 40-36 across the board for Cintron (1-0, 0KOs), who was the lone representative for his native Puerto Rico in the 2016 Rio Olympics. Antonio Vargas (2-0, 2KOs) - who fought for the United States in the 2016 Olympics - made quick work of Emilio Rivera in picking up his second consecutive 1st round knockout win in as many ring appearances. Two months after needing just 1:48 to win his pro debut, Vargas needed just four seconds longer to force Rivera (0-2) to return home empty-handed, dropping him with a left hook in the first five seconds of the bout and again for good with a straight right to end the bout at 1:52 of round one.